2015. The modern world is living in the web of the Internet, robots is no longer a fiction, and travel around the world you can go on an airplane without fuel. Technical progress, fast rhythm of life and the flow of information does not allow relaxing and disaccustoms to be surprised. Exactly in such situation, a breath of fresh air and a source of inspiration may become small, strange, frozen in time, the country — Nepal with capital Kathmandu. Nepal — it is the most mountainous country in the world. 6/7 of its territory is mountainous.In the country are concentrated eight of the fourteen highest mountain peaks of the world, the so-called "eight-thousanders". There is also the "Lady of Winds", the highest mountain in the world — Chomolungma, better known to us as Everest. The first documentary confirmation of the Nepal existence dates back to VII century BC. The country's capital, Kathmandu, for the first time mentioned in chronicles of the XIII century AD. According to legend, the city was founded by the decision of the Nepalese monarch Gunakamadeva. Suitable strategic location of Kathmandu on the ancient route from India to Tibet helped it quickly become a lively and important trade center. At the beginning of the XIX century, the British East India Company began to vigorously interference with Nepal with the aim to control trade routes from India to China.In 1814 began the Anglo-Nepalese War, which ended two years after the signing the Treaty of Sugauli, providing staying in the country English resident. As a result, Nepal has managed to preserve its sovereignty and independence from England was purely nominal. After that, the Nepalese rulers began a policy of self-isolation state. Today Nepal, shifting change of constitutions and referendums, repression in the ranks of the top management, the supremacy of the Communist Party and the Civil War, surviving court intrigue, mysterious massacre of the royal family and the overthrow of the monarchy, received the status of a parliamentary republic. The political and economic center of the country is the city of Kathmandu. It is located in the northwest part of the valley, in the heart of the Himalayas, in the place an ancient lake. 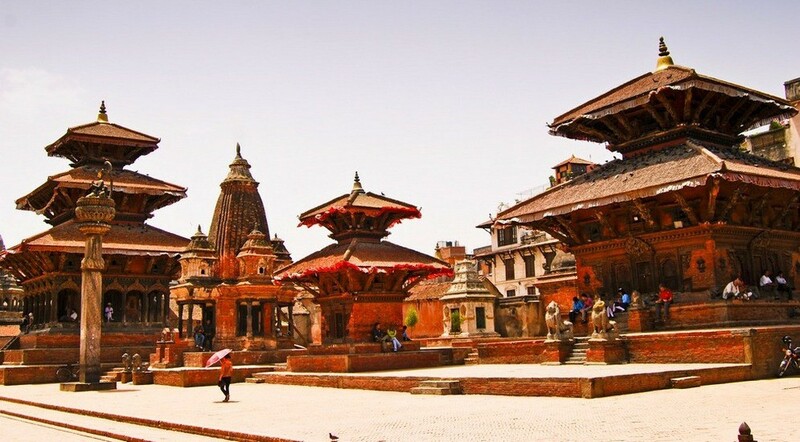 Despite the low level of development, the capital of Nepal is one of the centers of world tourism.Here is regularly observed congestion of Hinduism adherents, Buddhist pilgrims, trekking fans, climbers and fans of exotic. Hundreds of tourists from all over the world meet every day on the small narrow streets of the city center. Nepal and its capital are interesting and unusual in many ways. For example, there are several systems of chronology, which are based on different traditions and religious calendars.Each of them is noting and celebrating. Nationwide Nepal year begins on April 13 and conducts the readout ahead of the Gregorian calendar familiar to us for about 57 years. So now Nepal lives in 2072. Time in Kathmandu also runs its manners.While we are accustomed to the fact that the difference in time zones is the full hour, two, three or four hours, Nepalese clock ahead of Greenwich for 5 hours and 45 minutes. While traveling in Europe easy to move between the two countries on cars, for journeys between Mexican cities fit comfortable buses, but the easiest way to cross Japan in an armchair of white Shinkansen, the most convenient mode of transport to and from Kathmandu will be the plane.Tribhuvan International Airport is located just 5.5 km from the capital. It has one runway and plays host to it the aircrafts of other countries. A direct flight from Ukraine to Nepal at the moment does not exist, but you can get a transfer, for example, in Delhi, the Dock, Abu Dhabi or Singapore.In connection with the recent earthquake in mountainous country, the geography of flights may be changed. Our flight from Kiev to Kathmandu was not limited to one change. The route lay through the airports of Dubai and Delhi.During the way we are very tired, and everything was seen triple sharply. Despite the fact that the trip to Nepal was an unusual dream for a few years, one of Kathmandu which appeared before the eyes in the first minutes amazed me. And it was not a delight. I was terrified. Came oppressive sense of strange, incredible and uncivilized country: Empty airport where no planes, no attendants, dust kilograms hanging in the air, cheap means of transportation, moving skipping the absolute off-road, the poor tramp sitting on the ground here and there, and complete mutual misunderstanding with local residents. That was the first instant impression of Kathmandu. If ever you find yourself in a similar situation — get yourself together, breathe deeply, calm down and continue the journey. Anyway, you cannot buy a plane ticket to immediately fly away to another country — no ticket offices at the airport or find them very difficult. Next to Tribhuvanom is little more than a tiny airport of local significance. Local flights depart to Pokhara, Bhadrapur, Lukla, Surkhet, Mahendranagar and many other cities in Nepal. In total, there are more than forty airports and around one hundred helipads. The names of local airlines inspire and make smile: "Buddha Air", "Yeti Airlines" (the same Yeti — a snow man) "Agni Air" (Agni — Indian god of fire), "Cosmic Air". The cost of the ticket depends on the distance of the flightand varies average from 90 to 170 US dollars. Many air carriers offer hour flight over the Himalayas, during which you will be shown the highest mountain of the earth and allow admire the view from the cockpit.The flight goes on a miniature plane ticket for which will cost you about $ 160. Plane in Nepal — is one of the most comfortable and fast means of transportation in the country. Even under the condition that the experienced traveler distances between cities at first seem ridiculous. The total length of highways in Nepal is 11,456 km, and the railway — 52 km. 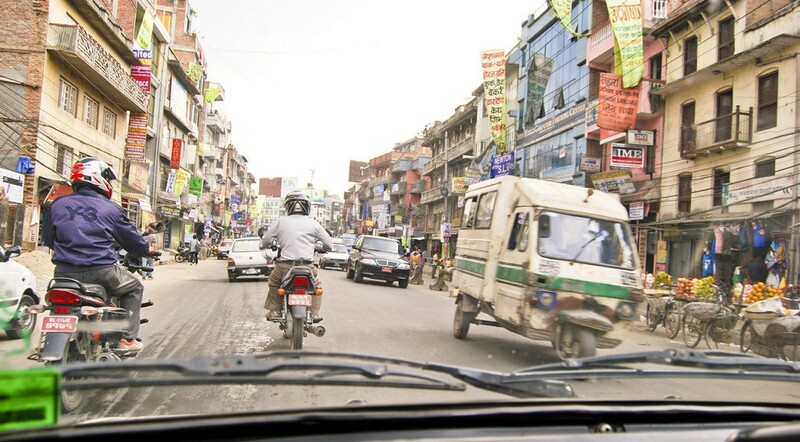 The distance from the airport to Thamel, one of the main tourist areas of the city of Kathmandu, small, and even with the caps takes no more than twenty minutes.The center can be reached by tourist bus or taxi. Urban taxis in 95% of cases — a white baby Suzuki Maruti 800. Often these cars resembling the Oka dimensions, decorated with colorful stickers and a variety of shiny overlays "chrome." Inside, on the seats are small bed Tibetan rugs. Typically, if the outside temperature does not exceed + 25-30 degrees, the driver keeps open all four windows in the car, and turns off the air conditioner. Only more heat is able to get a taxi driver to use air conditioning, which consumes more gasoline and consuming the already low power from the engine.When you moving around the city you must take into account the fact that the road is really dusty. During the ten-minute journey you have time to properly breathe a mixture of sand, debris and dust with other impurities.The overwhelming majority of local use to transportation around the city a special rag mask, similar to the multi-colored gauze. They are sold in pharmacy stores and shops of different things.The acquisition of such a device does not greatly facilitate your pocket, but the movement around the city by blown taxi will clearly ease. The cost of travel by taxi is about 200-300 Nepali Rupees (local currency — Nepalese Rupee, US $ 1 = about 102 Nepalese rupees). To go by car, of course, is more convenient than the bus: Taxi is waiting for anyone but you and the final destination will be selected because of your choice. In the tourist center of Kathmandu in Thamel, in the narrow dusty streets for tourists waiting rickshaws. The special structure of these bicycles allows you to "driver" accommodate a separate sitting behind one or two passengers. Of course, this vehicle does not possess the same speed as the car, but for sightseeing trips in the center is fine. In addition, the price for this service is substantially lower prices for the services of a taxi driver. Apart from the transport, oriented on tourists in Kathmandu there is a wide range of local vehicles.It's the possible numerous motorcycles and scooters, miniature colored minicar brand new, "frayed" minibuses, tuk-tuks of various stripes, colorful rickshaws, huge and always colorful trucks, strange heavy tillers, pickups for cargo and passenger transportations, solid expensive jeeps for thin, but very wealthy layer of society, a variety of prominent consular and government executive class cars that stand out the ambassadorial white Toyota Land Cruiser 200, bright as tropical fish, buses, bicycles dusty battered life, attain the age Japanese cars.In Patan, one of the parts of the city, you can meet the trolley. There is no subway in Kathmandu. Separate discussions deserve the local tuk-tuks. 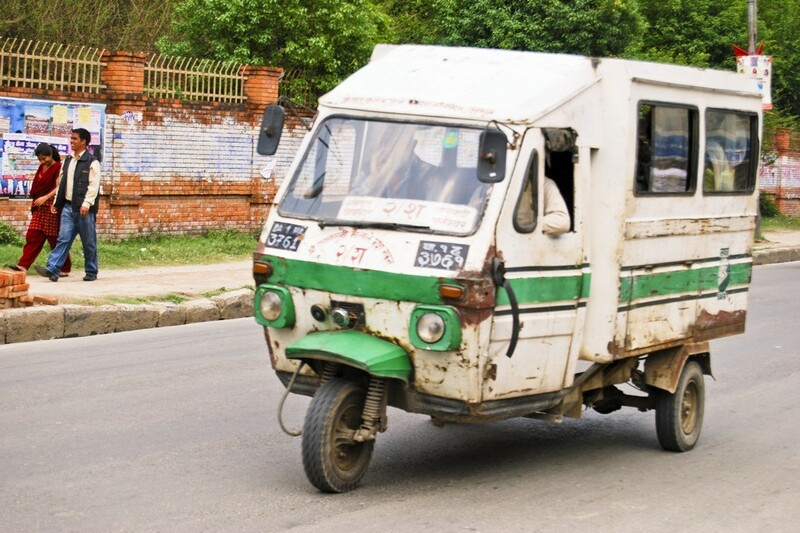 By itself, the tuk-tuk is a kind of covered scooter. It is one of the most common means of transport in many Asian countries. 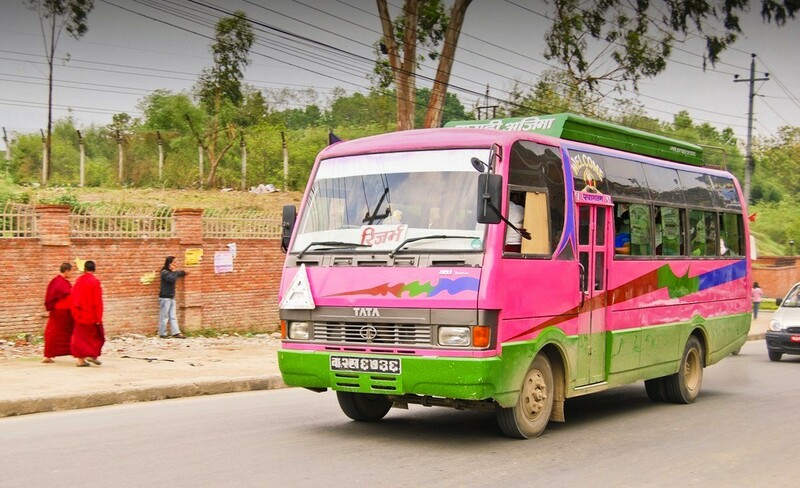 In Kathmandu this type of transport is presented not as wide as, for example, in Thailand or Sri Lanka. Here it is used mainly for the transportation of small loads or as a cheaper analog of taxis for the locals. City minibuses (numerous frayed minivans) romp through the city in a hundred directions. This transport is never empty.Unlike our routes, in the local door is always open. Overhang of it out, sitting on the doorstep a special person who is on the move loudly shouting in the street a route and the final destination of the machine, thus attracting potential passengers. All Nepal and, in particular, Kathmandu — is terrain with an unusual for us link sided movement. All vehicles are RHD. LHD car we have not met even once. To judge on the transport stream Kathmandu "approximately", then we can say that about fifty percent of road users — is a two-wheeled machines.This is mainly Indian TVS, the British Royal Enfield, the Japanese Honda Hero and Suzuki with small patches of Chinese motorcycles. Local "English" and "Japanese" are brought into the country from neighboring India, in the factories where they are produced. The remaining fifty percent is divided between taxi, bus, buses, trucks, tuk-tuks and motoblocks. There is a little bit of private individual. Among them: Japanese-Indian Suzuki Maruti, Indian Mahindra and Tata, the Japanese Toyota and Honda, «American» Chevrolet assembly in South Korea and the Korean Hyundai. At a cursory glance, the number of new vehicles in the total weight of in the best case approximately ten percent, this is quite small. The dominance of motor vehicles, the abundance of old cars and a small proportion of new motor companies are easily explained. The main reason is the price.The average price of a motorcycle in Kathmandu is almost no different from its value in Russia. In contrast, the Nepalese price of a new car more than twice as expensive as its Russian prices. High taxes on imported equipment make the cost of four-wheeled vehicles such sky-high. Another vehicle that arouses interest –it’s trucks. Accustomed to the visual look of our often nondescript, machinas, concerned an opportunity trucks, and even in Kathmandu, seems quite doubtful.But the Nepalesetrucks — the yellow, green, blue, red, variegated and multicolored machine.Many of them are hand-decorated with drawings depicting deities, animals or plants, colorful stickers, reflectors, contain inscriptions, messages to other drivers, such as "See you", "Please, sound the horn," "Brother Bob", "Moderate speeds — long life ", etc.Indispensable "decoration" are the signs of an emergency stop, are mounted on different parts of the body in any number and configuration. Despite the existence of the specific traffic rules and driving licenses, driving manners and especially in Kathmandu — a separate issue.In a moment when, even as a pedestrian, for the first time render participants of traffic, immediately there is a feeling of absolute chaos.The movement works on the principle "I have to drive at all costs and as quickly as possible". Perhaps exactly what every local driver thinks.While driving he really ignores all possible rules, signs and markings. Pedestrians are necessary to be extremely careful and cautious.In a situation where on the "zebra" will be a man trying to cross the saturated, infested with cars road, drivers not only do not slowed down to let it pass, but also make every effort to ensure that does not allow to cross the street and to cramin front of a pedestrian. For the first time we are faced with the need to cross the active street during a walk along one of the central streets of the city, next to the Royal Palace. Traffic flow was more than lively.The motley armada of machinery moving at different speeds and randomly rearrange the entire width of the road, did not give a chance to switch sides. We hesitated at the permanently flashing yellow traffic lights and froze in expectation, with the hope to see at least any gap in the flow. Strolled past a local resident noticed our confusion, and approached encouragingly said in English: "They never stop. You should not wait. Just go". He smiled and waved us goodbye and left. Holding hands and not looking at the flow, we carefully started to cross the road.Someone signaled someone to slow down, someone just cut and left. We survived, but were glad that in the city there are few wide roads. Travelers, who want to take a car to rent, expect disappointment. This task is not one of trivial. During our trip we could not find a single office engaged the rental four-wheelers. The only way to merge into local flows for us was rent a scooter. But that's another story. To be continued.